Collaboration was the word of the day at the Hiring Our Heroes “Empowering Change with Employment”—for good reason. A glance around the Northeastern Ballroom where the conference was held, anyone could see the variety of organizations that joined together in the mission to help veterans each holds a piece to the puzzle to solve veteran unemployment and underemployment. Organizations are answering that call. The day was filled with information on how Veterans offer incredible assets and potential to civilian employers, regardless of their service branch and military occupation. There was also a special emphasis on the benefits of (and need to) hire and support military spouses as they find their way into a new civilian society. Those in the military community offer invaluable technical and non-technical skills such as leadership, rapid decision-making, emphasis on safety, teamwork and dependability. These skills, along with many others, create an incredible potential employee in any industry. Massachusetts Secretary of the Department of Veterans Affairs Francisco Ureña echoed the idea of moving beyond the standard level of care for veterans since we can do even better for these incredible candidates. Secretary Ureña had enlisted in the Marines the day after he graduated from high school. However, FASTPORT CEO Bill McLennan emphasized that the work doesn’t always begin with traditional employment. Because of skills gaps, many service members, veterans and spouses will need training to ensure they find the best career path. One of the most powerful ways to bridge these skills gaps are Registered Apprenticeships. 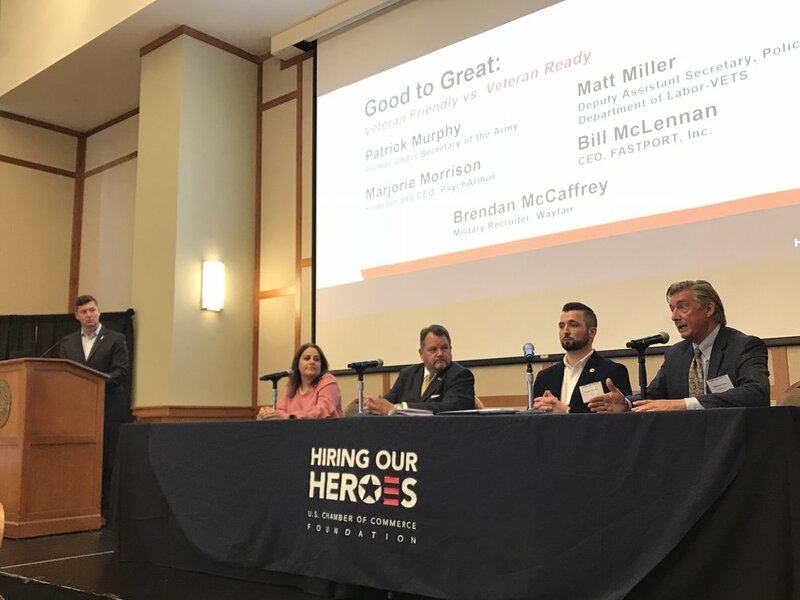 Facilitated by Former Secretary of the Army Patrick Murphy, McLennan added his perspective to the panel “Good to Great: Veteran Friendly vs Veteran Ready” as the Project Director of National Apprenticeship at FASTPORT in addition to his knowledge as the company’s CEO. As one of the U.S. Department of Labor’s Industry Intermediaries to increase apprenticeship accessibility in the United States, FASTPORT developed a National Standard of Registered Apprenticeship to allow employers from across the country to set up a DOL-approved apprenticeship program. That development has helped 21 companies build and expand apprenticeship programs under McLennan’s leadership. In just over 18 months, 4,000 candidates have enrolled into these paid training programs. A nearly 100% employment rate after completing their apprenticeship training means vast opportunity for both companies and the next generation of employees.